Buckingham finished the first half of the league campaign in a disappointing fashion, losing away in Manchester over the weekend. Knowing that Bowdon are always a tough proposition at home, Buckingham were keen to set their stall out early and they started well, earning a penalty corner in the first minute. However, Zoe Shipperley’s powerful strike was well saved and despite a re-award, a miss trap at the top of the circle saw the early opportunity squandered. Buckingham continued to have the better of the chances and plenty of possession in final third but despite this, they failed to create too many clear cut opportunities. Phoebe Richards was just unable to connect with joint Player of the Match Lottie Porter, who had the goal at her mercy following a great length of the pitch passing move midway through the half, and Richards was denied again down the baseline a couple of minutes later. However, a sloppy two minutes from the visitors would ultimately prove decisive. Bowdon always remained a threat on the counter and on a rare excursion into Buckinghams twenty-three they were gifted a soft penalty corner. The home side executed a slick routine and Welsh international Sian French made no mistake to open the scoring. From the push back, Buckingham immediately compounded the issue. Some poor passing resulted in the home side being gifted possession at the top of Buckingham’s own D and despite the ball striking an attackers foot prior to finding its way into the goal, the goal was awarded. Buckingham knew that it was now a long way back but they responded immediately. They went straight down the other end but ex Great Britain international Kirsty Mackay was out smartly to clear the danger. She denied Richards again a few minutes later and then was on hand to stop a snap shot from a Katrina Nicholson and immediately afterwards, a close range effort from Maddy Newlyn, just prior to half time. With joint Player of the Match Alex Naughalty to the fore, Buckingham continued the second half where they had left off and Mackay was swiftly off her line to deny Richards in the opening minute. In fifth minute Buckingham earned their third penalty corner of the match. They executed a well rehearsed routine that finally had Mackay beaten but despite the ball clearly striking the post player in the chest on the goal line, inexplicably, no penalty stroke was forthcoming, the rebound was cleared and the score remained 2-0 to the home side. Just two minutes later Buckingham were denied again by the width of the post. This time Richards shot finally beat the home goalkeeper but unfortunately ricochetted back off the inside of the upright and somehow stayed out. In a rare call to action Jackson made a fine intercept from a cross to deny home side a third before Mackay was agin called into more action. First she denied Millie Holme, then a fierce strike from Nicholson and a back hand effort from Eloise Laity who had made a welcome return from injury. The home side had a couple of half chances on the counter as Buckingham pushed forward but despite earning a number of penalty corners in the closing stages Buckingham could not find a way through and the game ended 2-0. The result sees Buckingham drop to sixth in the table but they remain in touch, only two pints behind fourth place. 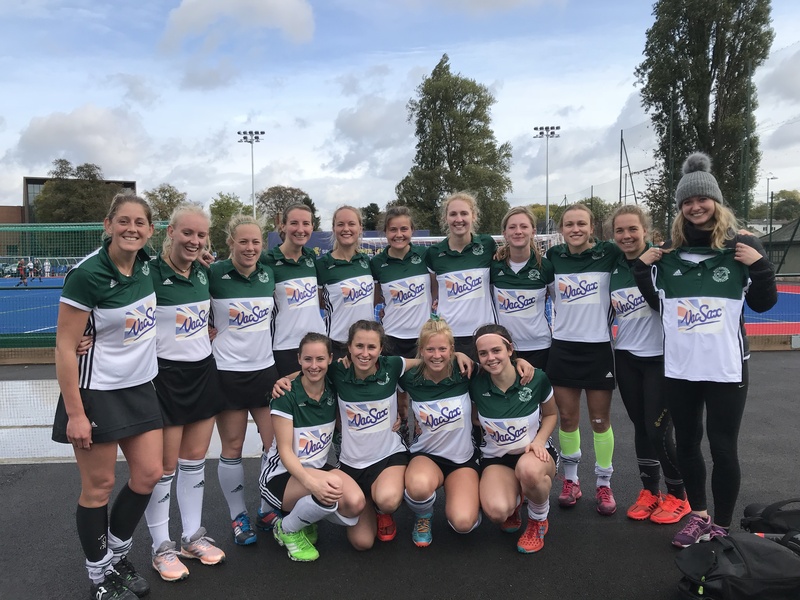 They now take a welcome break from the rigours of league hockey and after promotion last season, turn their attention to their Super 6’s Premier League indoor campaign. Saturday was a very disappointing end to the first half of the season. In all honesty, we weren’t quite as sharp as we would have liked in first half but still dominated and were very unlucky to be 2-0 down. Once again, the stats were hugely in our favour but the game is not played on paper. Although, certain aspects of our attacking play have improved markedly. Namely that we are now achieving a much higher percentage of possessions in our opponents D compared to a few weeks ago, we are still not converting them into the type of quality chances we would like or upgrading to penalty corners. We also do need to recognise that on Saturday we came up against an outstanding goalkeeper in top form. The result was frustrating and disappointing in equal measure but it cannot detract from what has been a very good first half of the season in terms of performances. It also gives us a very clear picture of where we need to improve post Christmas.